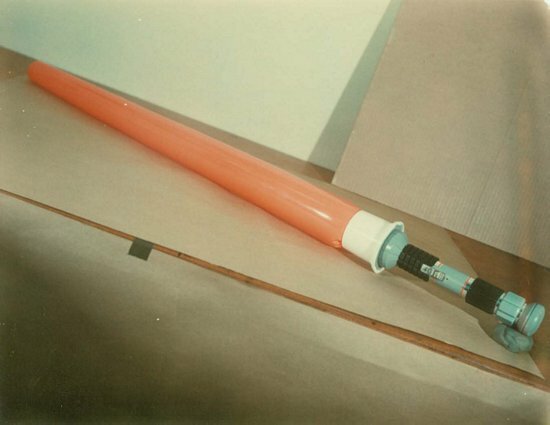 This confidential internal Kenner photo shows what is almost certainly the first three-dimensional representation of the Inflatable Lightsaber. This photograph, along with twelve others from this collection, is dated May 10th, 1977, a mere 15 days before A New Hope hit theaters. It is likely this piece was created shortly before that. Considering that it takes a toy company approximately 12-18 months to get a toy from concept to store shelf, we can see how truly behind Kenner was in bringing Star Wars toys to the market. This Lightsaber is handmade, probably created with a mix parts from other toys and accented with other materials. Another photo of a later design was recently unearthed and can be seen here.